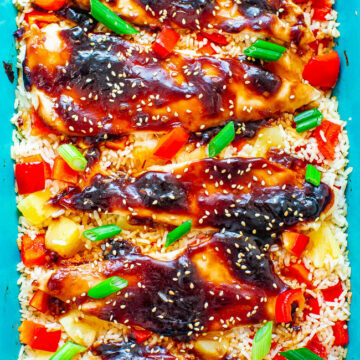 Baked Teriyaki Chicken and Rice – Chicken, rice, pineapple, and red peppers cook together in ONE pan for an EASY weeknight dinner that tastes like you’re in Hawaii!! The homemade teriyaki sauce adds so much INCREDIBLE flavor!! After a recent trip to Hawaii and eating both lots of Asian food and pineapple, I wanted to bring a little Hawaii back to my California kitchen and this recipe did just that. Juicy chicken is generously coated in homemade teriyaki sauce, crisp-tender red bell peppers, juicy pineapple chunks, tender rice, and fresh green onions for color and flavor. There’s also plenty of garlic and ginger which is a must in Asian-inspired recipes. I used 1/2 teaspoon red pepper flakes in the teriyaki sauce and two tablespoons chili garlic sauce in the chicken-rice-vegetable mixture. If you’re sensitive to heat and spices, I would either reduce or omit one or both of those. We didn’t find the dish spicy, and rather just thought it had lots of flavor, but we also relish spicy food and aren’t very sensitive to heat. Do as you see fit for your family or personal heat preferences. The easy, ultra flavorful, and very thick homemade teriyaki sauce literally takes less than 5 minutes to make and it’s so good. You will likely have extra sauce that you can use for serving or save it in the fridge for weeks. However, if you are short on time or are feeling a little lazy, I’m sure that you could use store bought teriyaki sauce. I would make a mixture of half store bought hoisin sauce and half store bought teriyaki sauce if you’re going the store bought route for proper viscosity. Pure teriyaki I think would be too runny and thin. Since my daughter and I love the combination of pineapple with savory flavors like teriyaki sauce, this was a total win for us. The sweetness balances the salty, savory aspect. I really liked that you’re able to mix together the rice, pineapple, and peppers in the baking dish you’re using, and that everything cooks together at the same time rather than having to make the rice separately. Make sure you use ‘minute rice’ and not regular rice. Rice keeps this dish naturally gluten-free. Using thin-sliced or pounded chicken breasts will ensure that the chicken and rice are both cooked though at the same time. Do not use regular thickness chicken breasts, halve them if that’s what you have. 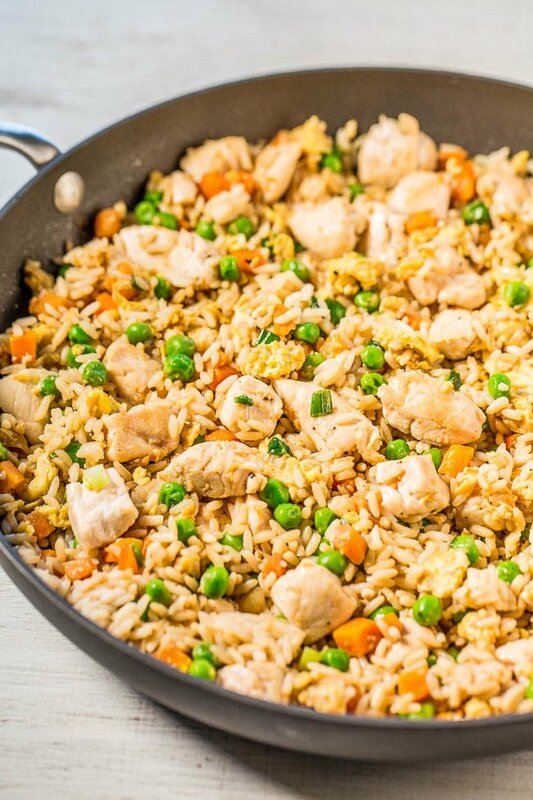 Easy Better-Than-Takeout Chicken Fried Rice – One-skillet, ready in 20 minutes, and you’ll never want takeout again after tasting how good homemade is!! Way more flavor, not greasy, and loads of juicy chicken!! 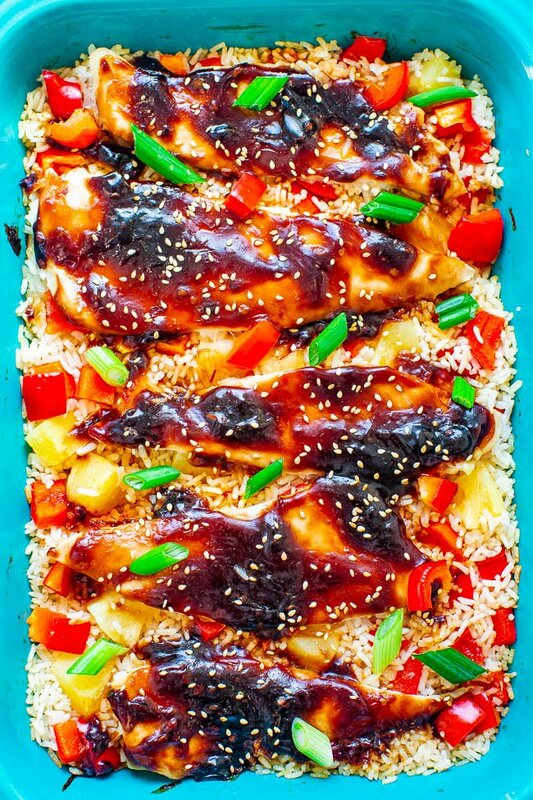 15-Minute Sheet Pan Teriyaki Chicken and Pineapple – Fast, EASY, and loaded with fabulous teriyaki flavor!! 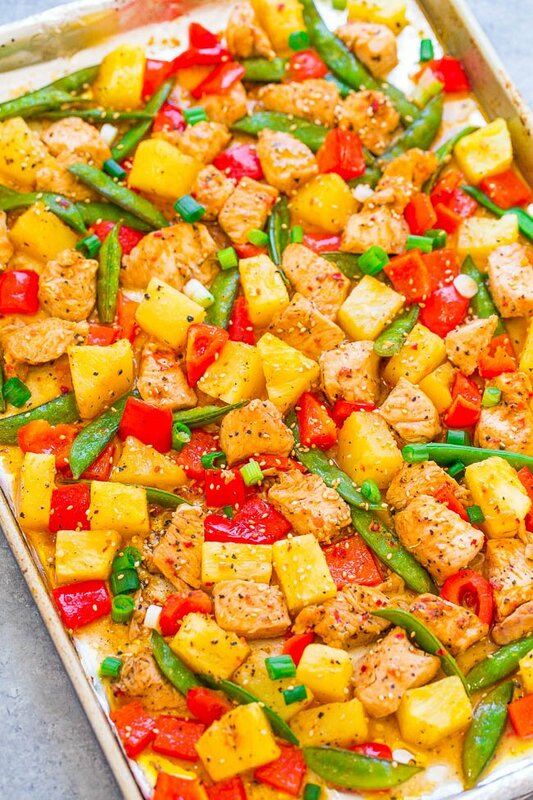 Tender chicken, juicy pineapple, and crisp-tender veggies make make for a DELISH one-pan meal with zero cleanup!! 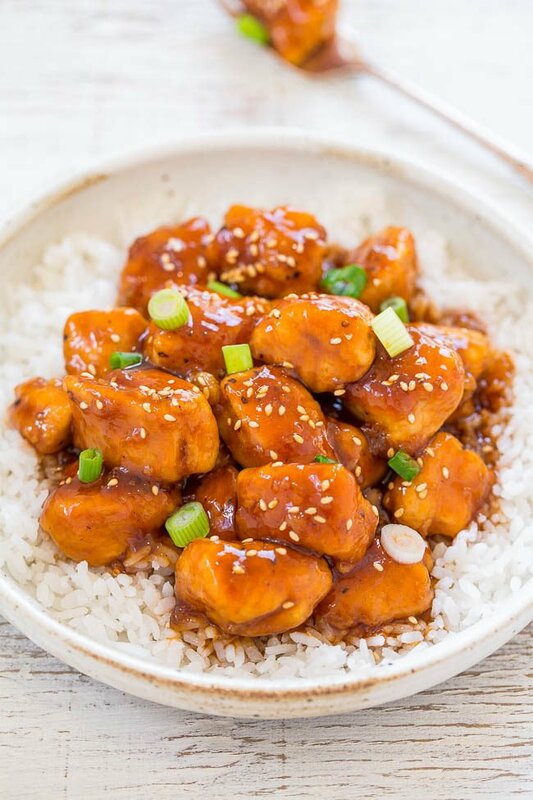 Easy 15-Minute Sweet and Sour Chicken – Faster, easier, healthier, and tastes BETTER than takeout or a restaurant!! 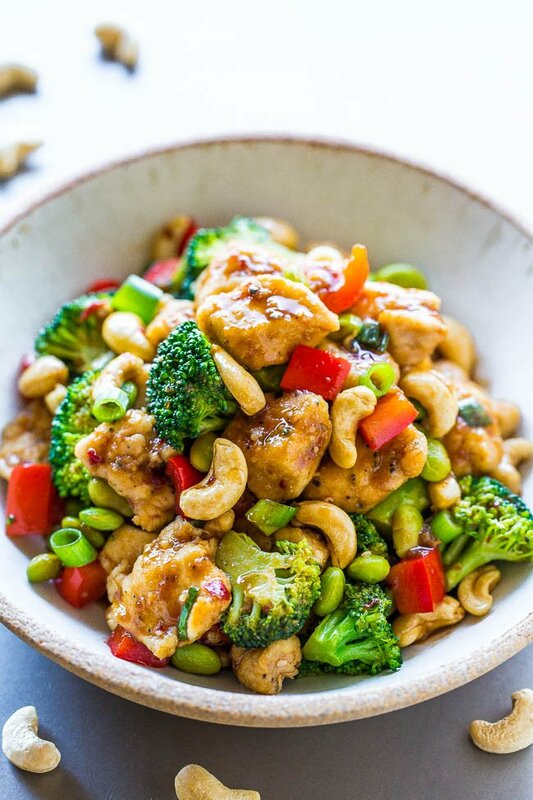 Perfect balance of sweet yet sour Asian flavors that the whole family will LOVE!! Preheat oven to 375F and spray a 9×13-inch baking dish with cooking spray; set aside. Teriyaki Sauce – To a medium saucepan, add the soy sauce, brown sugar, garlic, ginger, red pepper flakes (use less or none if you are sensitive to spiciness), and bring to a boil over medium-high heat, whisking nearly constantly. To a small bowl, add the corn starch, water, and stir to dissolve. Add the corn starch mixture to the soy sauce mixture, stir to combine, bring the mixture to a low simmer, and cook for 1 to 2 minutes, stirring frequently, or until teriyaki sauce has thickened to desired consistency; set sauce aside. 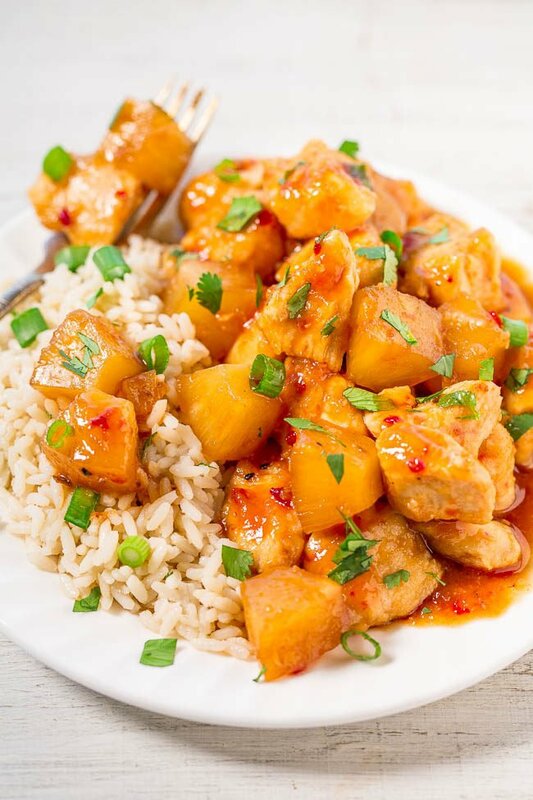 Chicken – To the prepared baking dish, add the rice, pineapple and juice, red pepper, chicken broth, optional chili garlic sauce (omit if you do not want to add spiciness), and stir gently to combine. Evenly lay the chicken on top. Dollop a generous amount of teriyaki sauce on top of each piece of chicken without actually ‘double-dipping’, i.e. touching the spoon from the teriyaki sauce, onto raw chicken, and back to the teriyaki sauce because you will likely have leftover sauce that you may want to use after the dish has cooked and you don’t want it cross-contaminated with raw poultry; reserve extra teriyaki sauce. Cover the pan tightly with foil and bake covered for 30 minutes. Remove the foil and bake for an additional 5 to 10 minutes, or until chicken and rice are both cooked through. Evenly sprinkle with green onions, optional sesame seeds, and serve immediately with the extra reserved teriyaki sauce if desired. Recipe will keep airtight in the fridge for 5 days or in the freezer for 4 months. Slow Cooker Hawaiian Chicken with Pineapple – Tender chicken with lots of pineapple makes you feel like you’re eating dinner on a Hawaiian vacation without leaving home!! Ridiculously easy, packed with flavor, and a hit with everyone!! 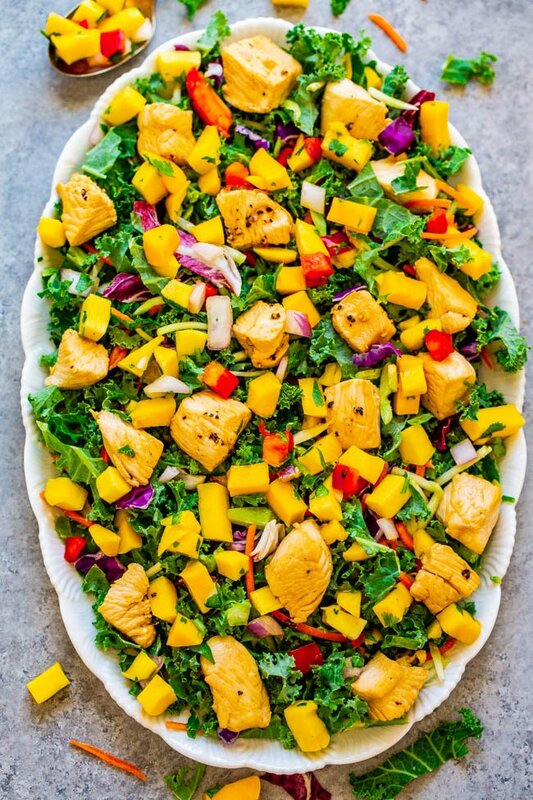 15-Minute Teriyaki Chicken and Mango Salad – Fast, EASY, healthy, and sweet mango is the perfect complement to the savory teriyaki chicken!! Save this recipe for when you need a FRESH and TASTY spin on chicken salad!! 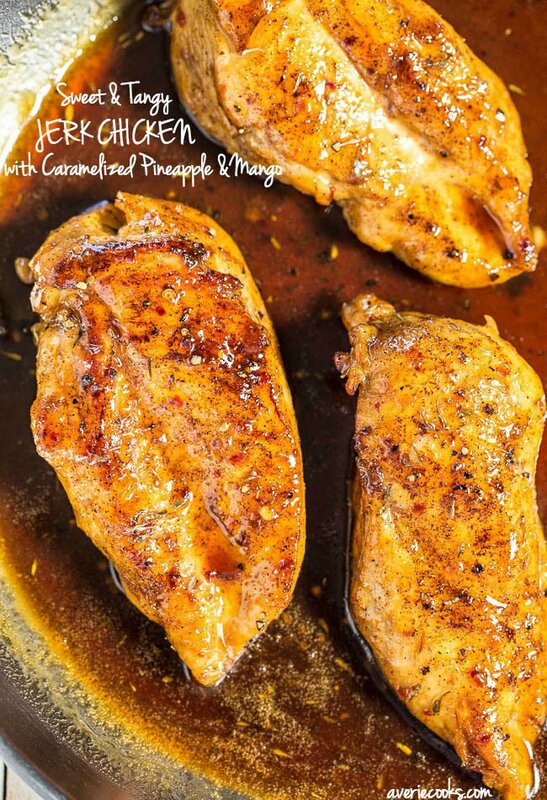 Sweet and Tangy Jerk Chicken with Caramelized Pineapple and Mango – Easy and ready in 15 minutes! Dinner that tastes like a tropical vacation is a guaranteed hit!! 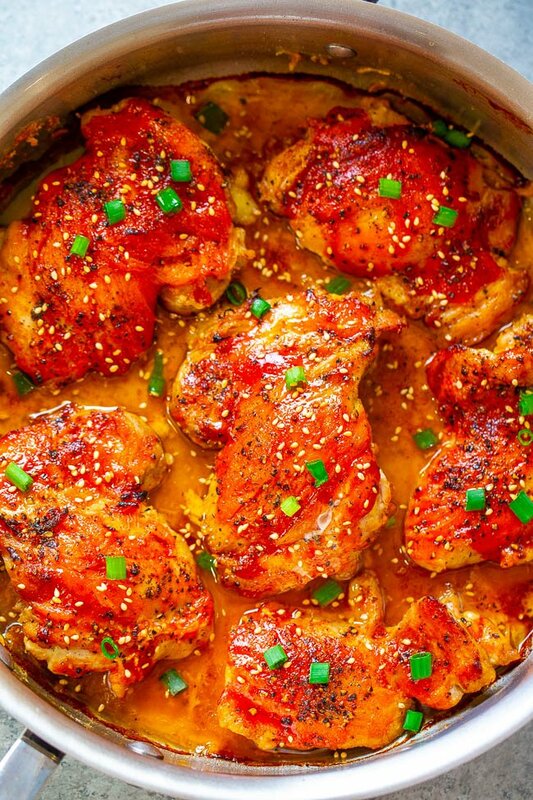 Easy Spicy-And-Sweet Glazed Chicken – Perfectly spicy with just the right amount of sweetness in this EASY, super flavorful recipe that leave you wanting more!! Crispy skin on the outside, juicy and tender inside, and so GOOD!! Yum!! 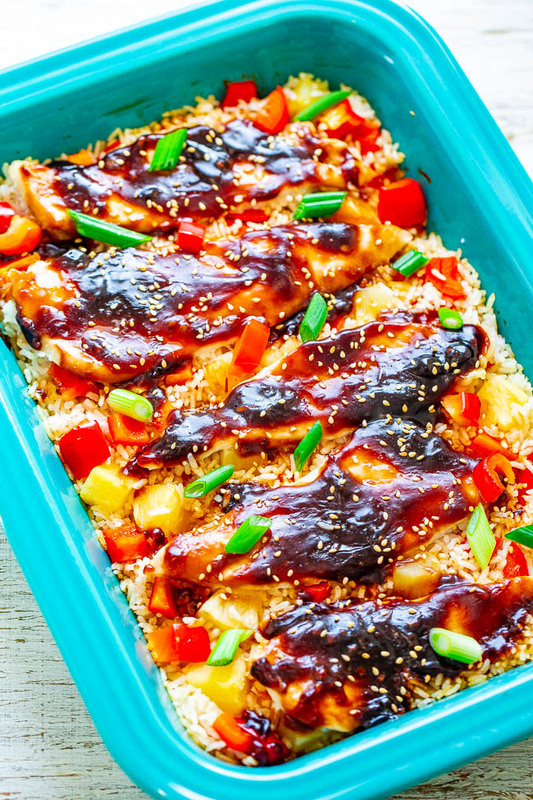 Gotta try this over the weekend–we love teriyaki anything! So cool you’ve been to Hawaii–it looks beautiful and is on my travel list. We recently went for a cheer competition my daughter had and we had an amazing time! LMK what you think of this after you give it a try. I have never Minute Rice as I always use regular rice. Is the Minute Rice added straight from the box and the juice from the pineapple used to cook it it? Or can I use regular cooked rice? Minute rice cooks much quicker than regular rice. I recommend it for this recipe so that it can absorb the pineapple juice. Regular, already-cooked rice will not do that; nor would it cook in time in this recipe. This was so delicious! I love pineapple with teriyaki and chicken so this hit the spot. Definitely worth repeating soon (as I do with so many of your recipes because they are healthy, quick and tasty)! Thanks, Paula, for the kind words and I am glad that you enjoyed this! I love pineapple with teriyaki, too. The salty/sweet combo is just so good!